We are heartbroken to report that we lost our wonderful greyhound Ajay. His illness came on so quickly and took him before we had a chance to accept it. Ajay will forever be in our hearts. He was a special greyhound in so many ways. 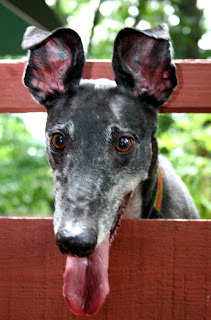 He was such a large presence in our lives and was not just the average greyhound. He was truly unique. His loss will leave a HUGE hole in our hearts. Race with the wind our precious boy. You were so loved and will be so missed. Rest in peace with the angels; and wait for us.